Written by Janet Choi on October 15, 2015 . Ever feel that tiny emotional tingle, that little rush, of getting a notification on your phone for a new message, an Instagram favorite, a Facebook tag? If you’ve been a long-time Facebook user, you might’ve felt the buzz from Meenal Balar’s work firsthand. Meenal was a growth manager at Facebook from 2009 to 2014 during the company’s stage of massive global growth — and her job was to get everyone, everywhere using Facebook every day. While email and mobile push notifications were foundational to Facebook’s engagement, Meenal’s team quickly learned that the deluge of social activity triggered notifications that had worked so well early on started to wear off. And when notifications don’t seem helpful, impactful, or delightful, they feel spammy, leading to opt-outs, unsubscribes, and even the dreaded churn. On top of that, many of the notifications that Facebook started out with — likes, friend requests, messages, pokes — rewarded already-engaged users. That “didn’t make a huge impact” on general user retention because those highly engaged users “were coming back to the site every day anyway,” according to Meenal. When the growth team took a step back, they realized it wasn’t enough to trigger just any notification. They needed to “show the right things to users at the right time — creating ‘aha moments’” where the user experienced the product’s core value. Rather than indiscriminately bombard the user with notifications, they concluded that they needed to be “really thoughtful about which messages to send which users” and focus “more of [their] resources on engaging users that were likely to churn.” Taking a page from Facebook, here are 5 kinds of engagement messages that work to activate, retain, and grow customers. Highly personal and targeted, these emails show off your product’s core value, ferry your users to their “aha moments”, and get people engaging with your product and brand again and again. 1. Send a motivational nudge to inactive users. Don’t neglect the parts of your user base that are most in need of a re-engaging nudge. The lack of activity is still a key behavioral trigger. Buffer, the social media marketing tool that makes it easy to schedule your posts, uses social proof along with education to spur people back into action. Their email juxtaposes your lack of activity next to the impressive accumulated activity of their users. Telling you that people sent over 3 million updates with Buffer last week makes you wonder whether you should get back on that social media train. But the message isn’t designed to make you anxious. Maybe you need a hand with social media or got too busy to find posts. 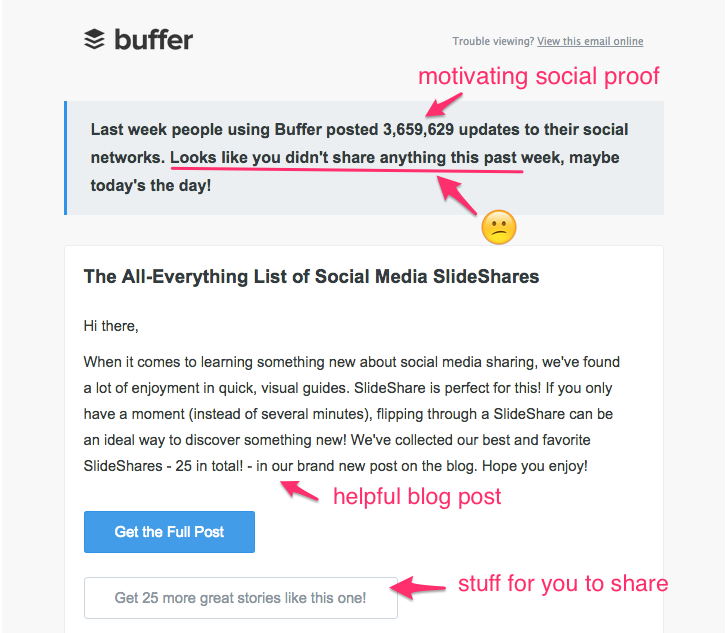 Buffer makes sure to include a helpful blog post in the same email. Ultimately, they’re speaking to the core value of their product, which is to make you more successful on social media. As part of their onboarding process, Zapier — a company that lets you connect the web apps you use — identifies people having trouble getting started and sends targeted emails to get them using integrations. 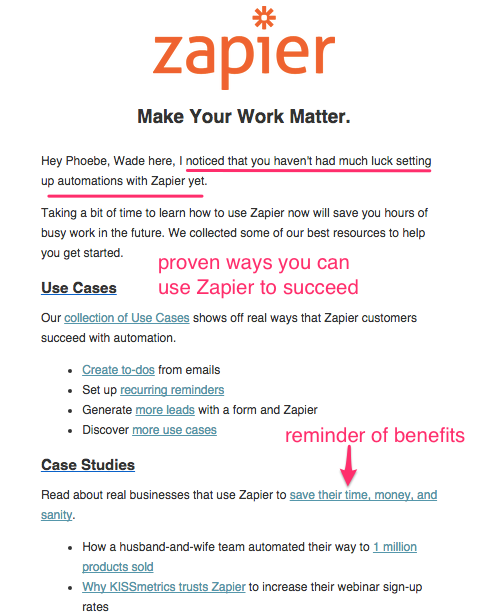 Click for full email By including concrete use cases, the social proof of case studies, and offers of help, Zapier reminds people of the value it offers — save precious time, money, and sanity — and aims to activate idle users who want to use the product but simply haven’t had the time to hunt for useful integrations in the app. 2. Teach people about themselves. It’s simple — you’re interested in yourself. There’s a reason why the word “you” is the most popular word in Facebook ads: your brain lights up when you hear or think about your own name or yourself. You already have lots of data about your users. How can you use that information to teach people something about themselves? It’s not only a compelling email to open, it motivates people to re-engage to gain more insights about their behavior and progress. Every Friday, Mint — the personal, online financial manager — sends a customized statement for all of your accounts: It’s illuminating information at one glance — just by opening this weekly summary, you get a pretty good idea of where your money has gone. Mint isn’t waiting for anyone to log in: they’re providing you added value from the data already in their system and delivering it straight to your inbox. 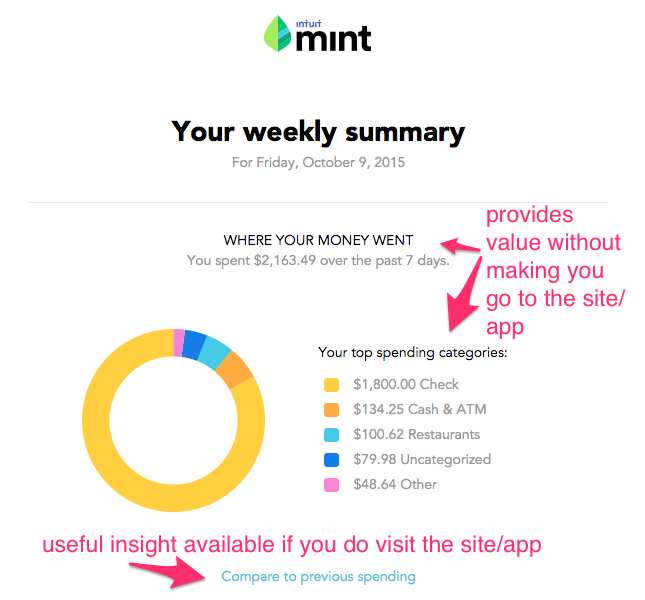 Note the call to action to “Compare to previous spending.” Users whose interest was piqued by the chart can re-engage with the full Mint website or app to find out more about their spending habits, but it’s not the primary message. Real-time chat app Slack’s email notifications take an interesting tack, giving whole team statistics. 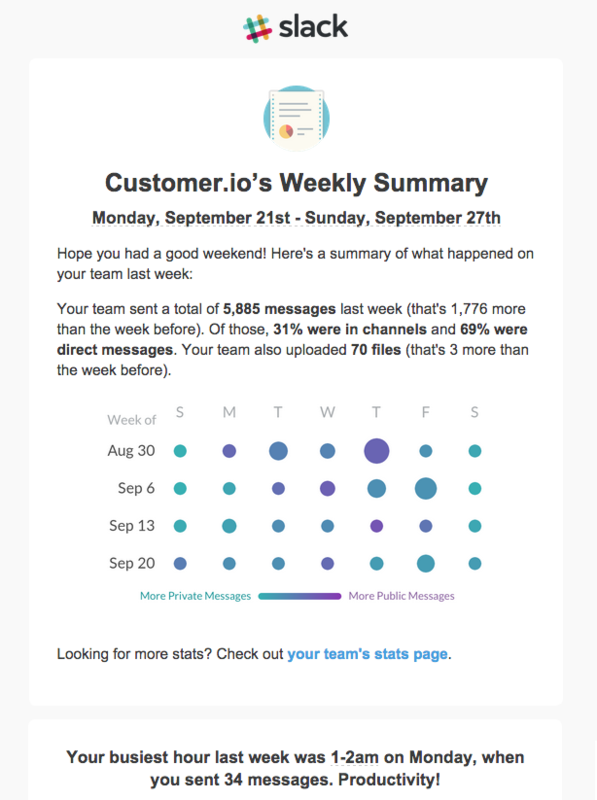 These weekly email summaries go out only to team owners and admins — and they show people who’ve made the adoption or purchasing decision within their organization how much value that Slack is generating. The analytics display also provides an underlying reminder that Slack is more than a chat application, it’s your workplace’s system of record for communication. Plus it shares handy tips and insights, including the balance between public and direct messaging, giving you insight into the culture of communication for the week and month. We’re wired to seek rewards. And we’re motivated to repeat experiences that led to the reward. Engineering user success, celebrating people’s progress, and rewarding them can be a great way to promote the brand and re-engagement. Congrats on this milestone, so keep going…. Remind helps teachers, students, and parents communicate securely via mobile messaging (and that’s where, incidentally, Meenal Balar is now VP of Marketing & Partnerships). They congratulate and encourage their customers when they hit certain milestones, including sending their first 5 messages. After sending 5 messages, people receive recognition, a nudge to send or schedule additional messages, and a link to learn how other teachers are using Remind. Here Remind is still onboarding and activating people. It’s a matter of tapping into a user’s behavior and not just encouraging them to do more but attempting to trigger a rewarding cycle of activity through “aha” moments. We’re all doing a great job! 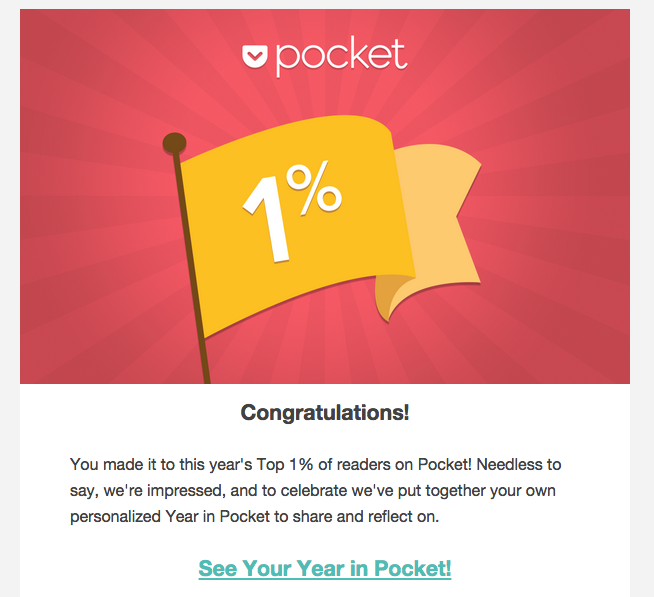 Pocket, makers of the save-to-read-later tool, sends out a congratulatory “Your Year in Pocket” email at the end of the year to their most active users, the top 1% and 5% readers. The email links to a personalized report of how much you’ve read, most-saved topics, daily routine, and most popular saved articles. 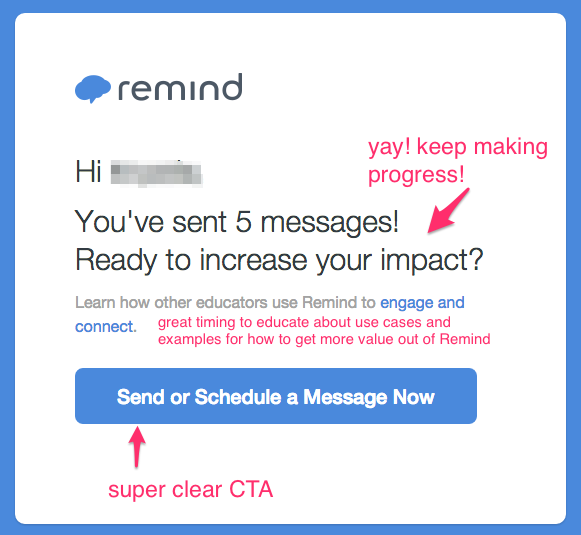 This email frames rewards in a way to get superusers to level up their engagement. Not only does it boost confidence and loyalty to the product, it’s an opportunity to show off — and spread the word to bring in new prospects. Recommendations — as long as they’re done well, without annoying or distracting — are a great way for your customers to re-discover your product’s value, get re-delighted, and remain interested in what you have to offer. A strong recommendation engine relies on enough user activity to get a sense of preferences. Netflix is famous for its recommendation algorithms. Use it enough, and the emails they send you about new additions to their catalog will almost be guaranteed to appeal to you, as in this email I received about a new TV show. 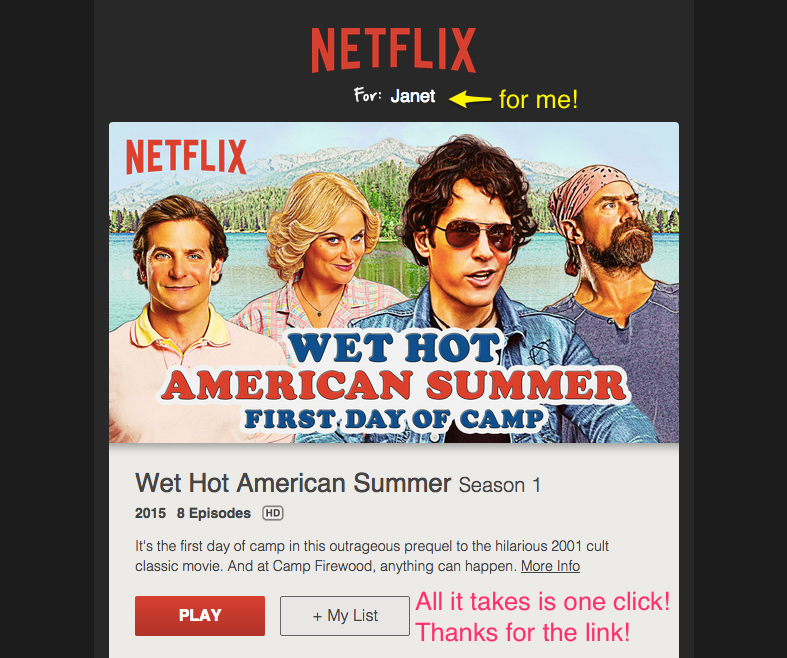 These emails do 3 critical things: they feel fresh and timely because they promote new or newly available content, they help you make that sometimes-paralyzing decision about what to watch, and they make watching or adding to your queue as easy as one click. Refer back to happy history. Another type of recommendation hooks into user history and habit. 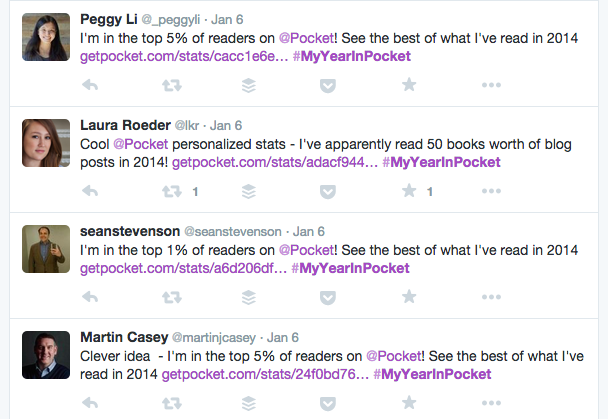 Tap into existing data about your customer’s past experience and behavior to recommend something they’ll like. Sprig is a mobile app where you can order healthy meals on demand. Here’s a push notification that announces the return of dishes that you’ve rated highly last time around. 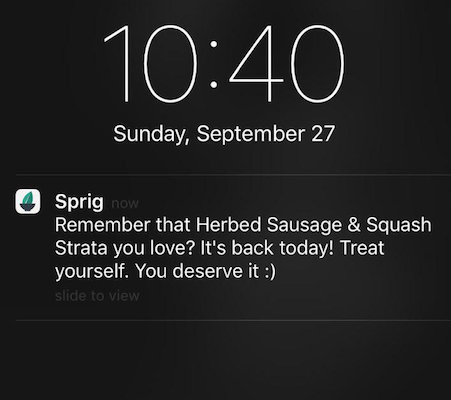 This kind of thing works for Sprig because they have a rotating menu of dishes: when a dish that you rated highly becomes available again, it makes sense to receive a notification about it and some cheerfully encouraging copy like “Treat yourself. You deserve it :)”. 5. Tap into social or industry cycles. We’ve covered quite a few ways to engage people with your emails, but what about the straightforward promotion? Simply sending an email presenting your wares is pretty common — but what happens if you time it to when your customers are more likely to buy? Thinkful, the mentor-led learning program for adults looking to advance their career, sends a fall email scheduled perfectly with back-to-school time. Click to see full email. 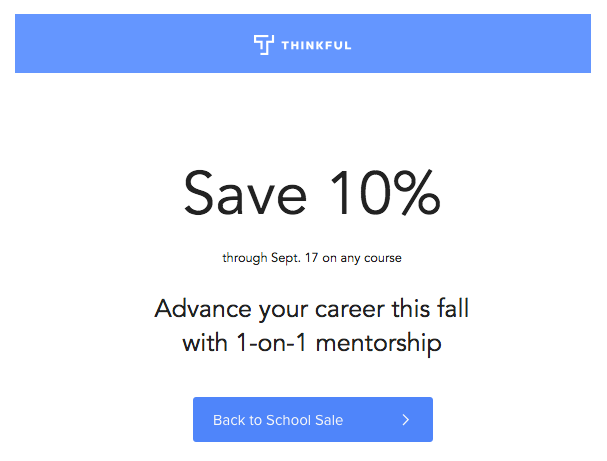 Their email is titled, “Go back to school with mentorship – Save 10%.” What’s powerful about this email is that it taps into that time in your life when you were continually learning and growing, connects that feeling with their educational offering, and targets prospects who aren’t already enrolled in Thinkful programs. It’s a smart move. Nearly all of us have experienced that transition from summer vacation to the leaves changing and feeling of personally turning over a new leaf. Holidays and birthdays are expected dates to send promotional emails — but take advantage of other times of the year that are distinctly pertinent to your audience! This is just a sampling of 5 techniques for engaging your customers. What are some of your favorite methods?